2017-12-01 Polyorchard performs at Elsewhere (Greensboro, NC) Aaron Bachelder, Vatel Cherry, Eugene Chadbourne, Michael Thomas Jackson, David Menestres. Part of First Friday celebrations in conjunction with an artist talk by Monique van Hinte. Event runs from 6-10pm, Polyorchard will perform at 7pm. 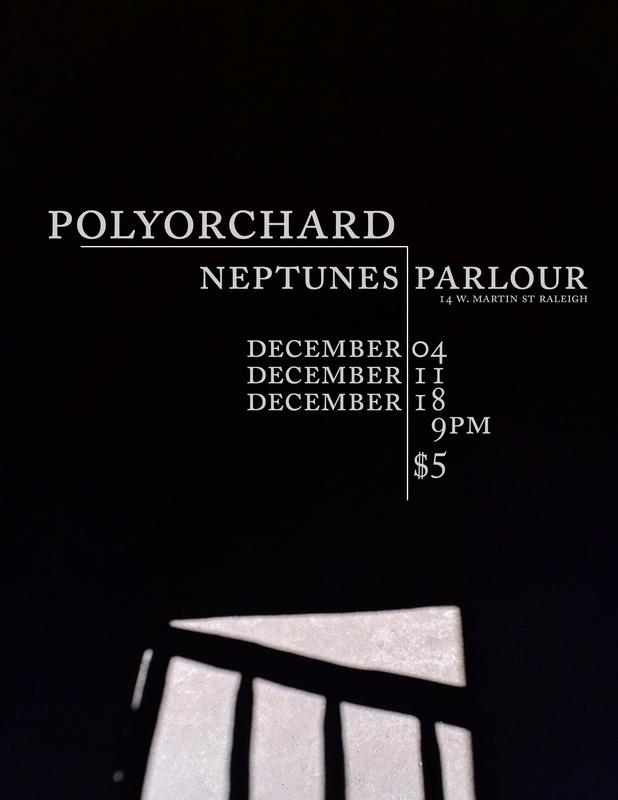 2017-12-04 Polyorchard’s Residency at Neptune’s Parlour (Raleigh, NC). Spontaneous compositions and another annoyances for clarinets and low strings, with Crowmeat Bob, Michael Thomas Jackson, David Menestres, Charles Phaneuf, and Dan Ruccia. 2017-12-05 Polyorchard Exsufflation Series at The Carrack (Durham, NC) with Crowmeat Bob, Jil Christensen, Bill McConaghy, David Menestres. 2017-12-11 Polyorchard’s Residency at Neptune’s Parlour (Raleigh, NC) with Jil Christensen, Bill McConaghy, David Menestres, Charles Phaneuf, Dan Ruccia. 2017-12-18 Polyorchard’s Residency at Neptune’s Parlour (Raleigh, NC) with Jason Bivins, Laurent Estoppey, Shawn Glavin, Bill McConaghy, David Menestres, Charles Phaneuf, Chris Robinson. Performance will include the US premiere of Estudios Edafonicos by Alan Courtis and a special duo set from Zkrabuj et chou et pâté. Recorded live in concert in the basement at Neptune’s Parlour (barely more than a week after the studio sessions that resulted in the previous album Color Theory in Black and White), the quartet spins ideas with the tensile strength and malicious beauty of a spider working alone in the dark. Polyorchard is a flexible fighting unit, expanding and contracting as needed to face the battle of the day. The Red October quartet features players who have been the foundations for several strains of Polyorchard since its inception in December of 2012. Within seconds of listening to Red October, I felt as though I was the steel ball in a pinball game – the subject being manipulated inside of a glass box. I’m not suggesting cheap entertainment, but rather implying that, like the steel ball, this album propels you into the playfield: targets, holes and saucers, spinners and rollovers, gates. The gate motif often represents an entrance and an exit, a passage to a new beginning, and there are clear moments of a sounding procession throughout this album. Red October produces infinite possibilities of sound, and can be heard and experienced in infinite ways. There is an energy that consumes your consciousness, traps you in your own mind, and releases you as a means to undergo a transformative experience. …the group displays a bold commitment to the practice, not the genre, of improvisation. The distinction is a subtle but crucial one. 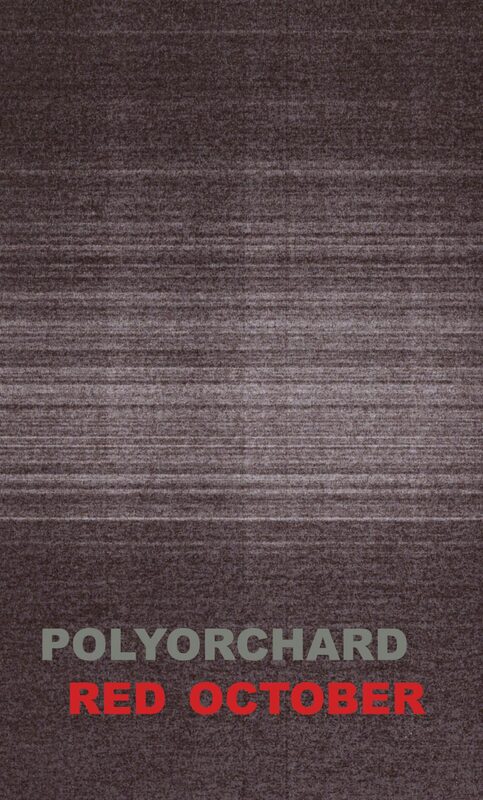 Where many free improvisation performances can fall into a predictable dynamic pattern of peaks and valleys, Polyorchard crafts intricate forms with clear but idiosyncratic arcs. Each extempore arrangement is packed with surprise. Just when they seem to be building in intensity and volume, they might cut it off before it boils over, as they do in the middle of “Montana.” They also avoid the exploratory feeling-out stage that improvised settings often produce. At the opening of “Seen” Menestres throws down a challenge in the form of a tense, rapid-fire phrase, which in turn sets the tone for the entire piece. Throughout these performances, dialogues quickly emerge within the turbulent flow then just as quickly dissipate and reform somewhere else. “Have” starts as a slow duo between bass and trombone on a melodic theme, but gradually disintegrates into particles of rough-hewn, pointillist sound, only to coalesce for a brief instant in a stomping groove. Even the intense conclusion of “Like” finds Bishop and Estoppey crafting tart melodic phrases around the scabrous interplay of Menestres and Galvin. The group also resists the enormous gravity of the horns–bass–drums format, rejecting all easy solutions to spontaneous group from. There are no drones, no genre/historical references (at least explicitly), and no resorting to high-intensity, free-jazz style blow-outs. This lack of shortcuts makes for a prickly, armored music but also a robust one. Even the more subdued passages, such as as the near-dirges that open “Montana” or close “I Would,” burn with a special intensity. Though their interaction might at times echo some earlier group (I hear the volatile, near-vocal dynamics of Charles Mingus’ classic Candid quartet in the middle of “Like”), they still retain their own voice, the specturm of improvised traditions deeply internalized. One key to the group’s sound is how they reject any hierarchy of instruments. Trombone, sax, bass, drums are, simply put, just devices for sound production, there to create a complex weave of interaction in which the traditional capabilities of the instruments are honored as well as extended. On the conclusion of “Like” the group creates a mix of proto-electronic textures, while on the opening of “To” they turn to vocal timbres and, in Bishop’s case, even some slow legato melodies. On the outro of “Montana” they take this even further, emitting all manner of wheezing, hissing and moaning in a secret, sublingual ritual. It should be noted here that Red October contains, in Menestres’s own words, “no previously agreed upon material.” Since this performance was recorded, Polyorchard has expanded its repertoire to include performances of text scores and compositions for field recordings and improvising ensemble, a move that can only enrich their already extensive improvisational lexicon. Yet Menestres’s statement is still somewhat jaw-dropping. After a good two months of visiting and revisiting this record, new aspects emerge on every listen, the band’s ability to create spontaneous structure consistently fascinating, and more than a little befuddling. 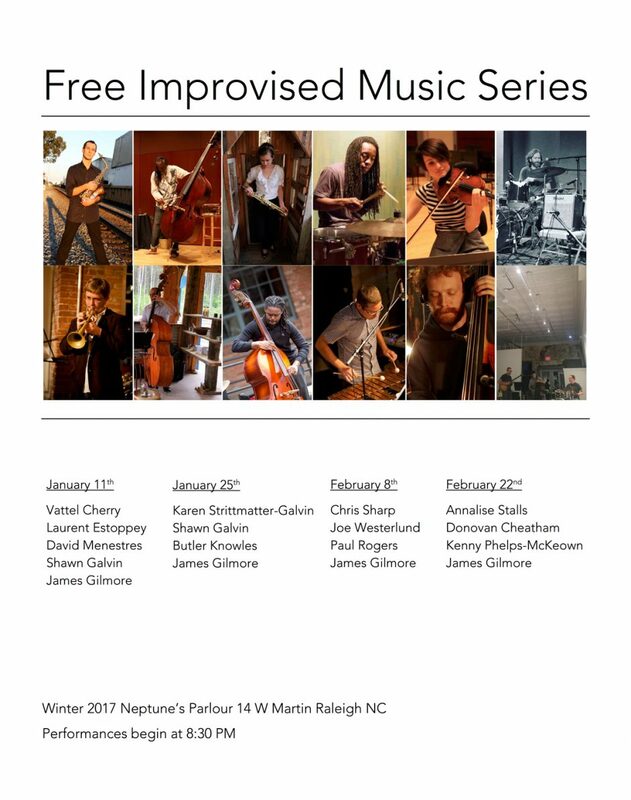 Free Improvised Music Series at Neptune’s Parlour (Raleigh, NC) night one, programmed by James Gilmore. Performing: Vattel Cherry, Laurent Estoppey, Shawn Galvin, James Gilmore, and David Menestres. Music at 8:30pm. 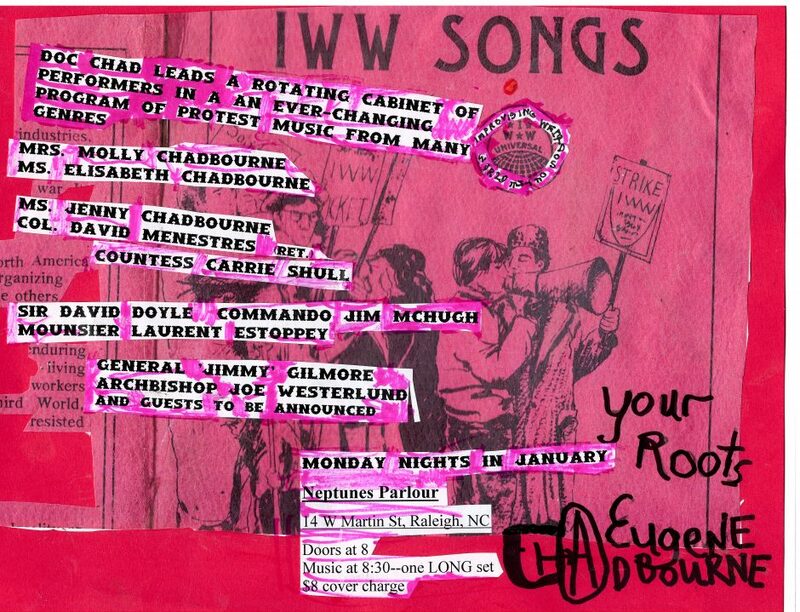 Eugene Chadbourne Presents the International Wonder of Weird Songbook every Monday in January at Neptune’s Parlour. Featuring a rotating army of weirdos including the Chadbourne Family Singers (Molly, Lizzie, and Jenny Chadbourne), Carrie Shull, Laurent Estoppey, James Gilmore. Dave Doyle. Joe Westerlund, myself, and other assorted oddities. Doors at 8pm. Music at 8:30pm. $8 at the door. 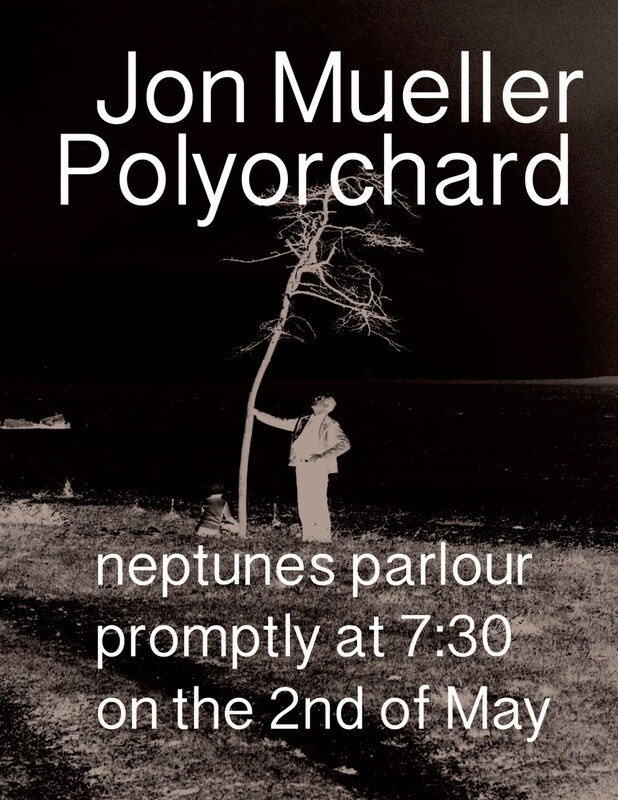 Polyorchard will be opening for the great Jon Mueller on May 2 at Neptunes Parlour. 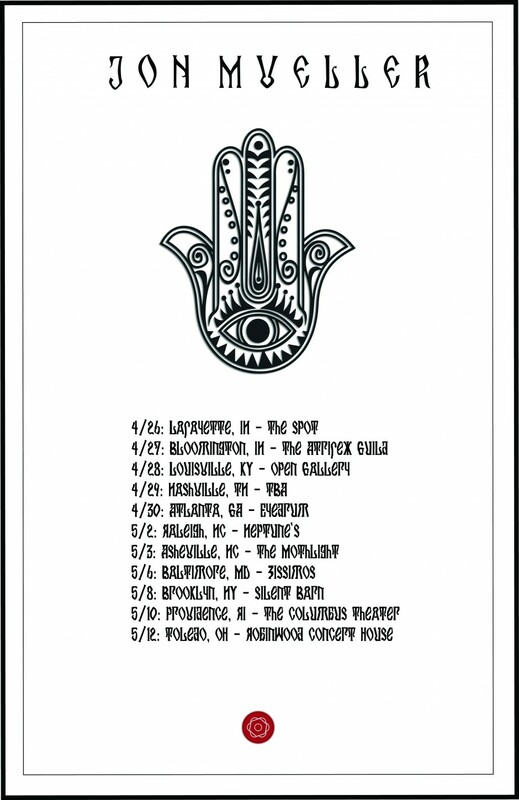 Very excited to be opening for one of my favorite musicians (Death Blues, Volcano Choir, Collections of Colonies of Bees, Pele, etc.). The show will start promptly at 7:30pm. Within a 40 minute solo performance of percussion and voice, using a hand-made Arabic bass drum and looped wordless vocals, Mueller conjures world music and sound while remaining very particularly other worldly. Drawing from minimalism and a variety of musical and non-musical disciplines, including meditation, trance, and physical stamina, Mueller’s solo performances have been described by audiences as resilient, intense, and meditative. The aim of Mueller’s solo performance is to engage an audience in listening practice by creating a variety of input both recognizable and not, understood and not, which causes a unique experience in each individual. Jon Mueller has been a drummer and percussionist for over twenty-five years, performing throughout North America, Europe, United Kingdom, and Japan at places such as New Museum (New York), The Arnolfini (Bristol, UK), Musée des Beaux-Arts de Montréal, (Montréal, QC), Issue Project Room (New York), Guggenheim Museum (New York), Alverno Presents (Milwaukee), Hopscotch Fest (Raleigh), SXSW (Austin) and Cafe OTO (London, UK). His recordings have been released by record labels such as Table of the Elements, Type Recordings, Hometapes, Important Records, SIGE Records, Taiga Records, and others. A founding member of the bands Volcano Choir, Collections of Colonies of Bees, and Pele, he has also worked with musicians Rhys Chatham, Jarboe, James Plotkin, Fred Lonberg-Holm, Marcus Schmickler, Asmus Tietchens, and Z’EV, dancers Molly Shanahan and Heidi Latsky and filmmaker Scott Kawczynski, among others. In recent years, Mueller has directed the multi-disciplinary project Death Blues, encouraging presence and celebration of each moment. More info at www.rhythmplex.com. You can check out videos from last summer’s residency here. Click on the photo above or here to read IndyWeek’s article on the Doc from last summer. Polyorchard will be opening for Ken Vandermark and Nate Wooley at Neptunes Parlour on Tuesday January 13. Polyorchard will be Jeb Bishop, Chris Eubank, Dan Ruccia, and me. 9pm show, suggested donation of $8-12. Read more here. 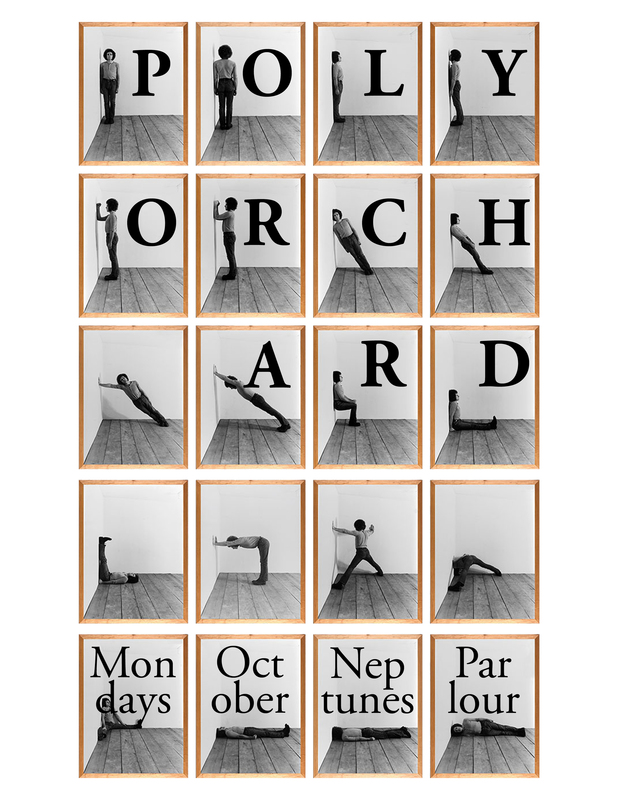 Monday 10/27 sees the final show in Polyorchard’s October residency at Neptunes Parlour with a wild incarnation of the band known simply as Polyorchard X Formation. Come see the freaks and geeks! 9pm $5 suggested donation. Monday 10/20 is the third night of the Polyorchard October residency at Neptunes Parlour. This night will feature a large ensemble formation of Polyorchard with a focus on winds and brass. Performers include Jeb Bishop, Laurent Estoppey, David Jordan, Jamie Keesecker, Bill McConaghy, David Menestres, David Morris, Bob Pence, Chris Robinson, Carrie Shull. The program will include variations on Eva-Maria Houben’s von da nach da and a new tune of mine called More Birds in Rhyme (aka stupid bird songs).